One of our "must visit" places at CHA last month was Basic Grey. 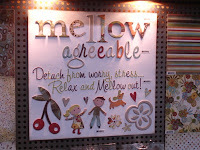 They always come out with some great cutting edge designs and products. When we were ready to place our order, Greg, helped us out. 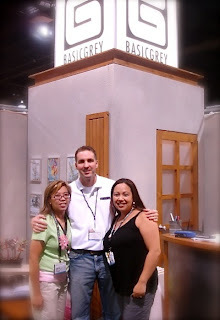 We found out that Greg is actually the co-owner of Basic Grey so it was fun to chat with him and tell him the specific needs of a cardmarker when it comes to designer papers. 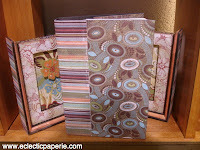 We let him know that small pattern designs and 6x6 paper pads are a favorite with eclectic Paperie visitors. He also let us know that they won't be coming out with a holiday line this fall but the popular Fruitcake line will remain available. 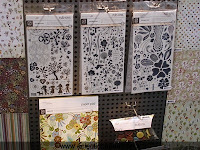 There are also some new chipboard albums, matching buttons and ribbons that are still due to ship at a later date. We did receive some really awesome rub-ons but we still need to get them up on the site. Wait till you see them! HEY JOY! I miss you already!